We create gorgeous outdoor kitchens. ​Outdoor living is something that is a part of just about everyone’s lives, in some form or fashion. Whether you are attending a backyard barbecue at a family or friend’s house or sitting poolside in your own backyard, every single one of us has an experience or memory attached to an outdoor event. But when you have a special place on your property to enjoy it, it makes taking in the sights and sounds that much sweeter and often is a place of refuge after a long day at work. One of the most sought after types of outdoor living is that of an outdoor kitchen. Give us a ring at (317) 344-8024, and set up your FREE estimate. In real estate, when you are trying to sell a property with an amenity such as an outdoor kitchen, you are not working with selling just “any old property” – an outdoor kitchen truly makes a home like this that much different than the rest! When a potential home buyer tours a home with an outdoor living space, such as an outdoor kitchen, thoughts of entertaining their friends and house guests come to mind. They begin to envision themselves living in this home. You see, when you have a second kitchen to work with, you can then bring the entertaining outdoors in a more wide-open space, while still being able to prepare a meal. It can also function as a great second preparation station when you are maxing out the use of the indoor kitchen. There are many types of kitchen ideas you can come up with, and most contractors have seen and head them all. I can recall when I was looking to purchase a home many years back. There was a house we looked at that had a multi-level outdoor living space. The kitchen had a built-in grill, a full stove, a wet bar and a refrigerator. There was also a tiki-style bar on the pool deck, which had the ability to be kept well stocked. There were three levels to the home’s decking, which had covered and uncovered areas as you walked around the pool, which was full surrounded by decking. When I first saw this home, it felt like any old house, but once we walked into the backyard, the oasis that we walked out onto felt like a welcoming, family-oriented space. The kitchen was the seller, in my mind! We put a bid on the home and ended up in a bidding war, which we ultimately lost, but there is no doubt in my mind that the new owners of that home have gotten a lot of use out of that kitchen. If I had the option to create a kitchen from scratch, I would make sure to add all the little details that would make it a place that I would find myself migrating to in the warmer weather months. One of the nicest things about having a kitchen outdoors is that your house won’t feel the effects of the heat if you use an outdoor oven. We all know that when it is 90-100 degrees outside, the last thing we want to do inside is turn our oven on! If you had an backyard kitchen that had an oven, baking fresh baked goods would be a snap, and you wouldn’t have to suffer in a warm house for it. A stovetop would be another good consideration to add, as well, because this way – you could have someone working on a grill while another person is working on the stovetop, making side dishes. ​Another addition I would add is a fresh herb garden box, which could be made of treated wood, at the preparation station. Having fresh garden herbs at your fingertips would be a great addition to an outside kitchen. Nothing tastes better than fresh ingredients, and so adding in some fresh picked basil or cilantro to your meals gives your dishes a flair of a fine restaurant. A wooden cutting block created by using similar treated wood might be an interesting way to incorporate the look of the wooden herb boxes and be a unique and cool addition when you are hosting an outdoor barbeque. You can entertain your guests while cutting up ingredients like tomatoes and onions, and not ruin your custom countertops. 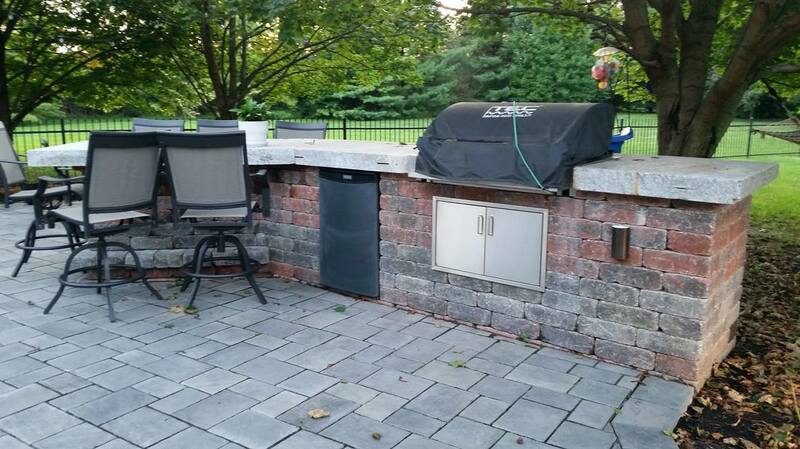 Another “grate” feature I would like to have in a custom outdoor kitchen is that of a fully functional outdoor barbeque grill, encased in the counter. You can hide the propane tank underneath the countertop and keep your workspace clean and spacious. This way, you can also have someone cooking on a grill while another person is working on preparation or cooking on the stovetop. Countertops are another thing that you must consider very carefully. The last thing you want to do is invest your money in a material that cannot withstand the weather of where you live. You can choose anything from pretreated lumber, which could pull in the accents of the butcher block and garden box in, or choose something more durable, like tile or even concrete! Countertops are a necessity in ANY kitchen and an outdoor kitchen space, it is not much different. You can always consider using granite, but it would be best to check with your supplier to make sure that they choose the thickness and porousness that will be able to sit in all weather conditions. The last consideration would be your seating arrangement. You want to be sure that when you are outside, enjoying your kitchen, that you have ample seating. Barstools stacked against a countertop or bar and comfortable chairs paired with an outdoor “kitchen” table. You can buy seating that matches the countertops or add splashes of color to create a truly comfortable living space that will feel inviting and relaxing. It also serves as a great place for your guests to sit while you prepare a meal. With so many choices and styles available when you create your outdoor oasis, you can easily find details and include things that make the space feel like YOU, which causes it to invite you to spend as much of your free time in it as possible, whenever possible!